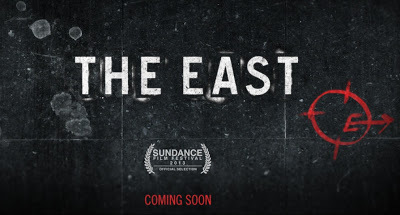 The East – Review – Screenkicker! The East has a lot to say and mostly succeeds in saying it. It’s the new film from filmmaking partnership Brit Marling and Zal Batmanglij and is the followup to their cult classic (I deserve more credit for that joke) The Sound of My Voice. The East tells the story of Sarah an operative for a private intelligence firm who goes undercover to infiltrate an eco-terrorist group known as ‘The East’. The East carry out guerilla attacks on corporations that pollute rivers, create dangerous drugs, or just be dicks to the environment. After Sarah gets her foot in the door by eating donuts out of a skip we meet the various characters in the collective. There’s William (Alexander Skarsgard), Izzy (Ellen Page), Doc (Toby Kebbel) and others. There’s a seven dwarves joke in there somewhere but i can’t be added thinking of it right now. This motley crew plan attacks such as poisoning pharmaceutical execs with their own dodgy antibiotics. Hmmm I wonder if Sarah can stop herself from getting drawn into their world of green activism? Of course not. Idiot. She may be the worst spy ever in that she folds like a cheap cardboard box when she claps eyes on William, the dreamy leader of the group. The movie raises some interesting questions about terrorism and the lengths that people should go to get their point across. Everyone in the group has their own reasons for fighting for this particular cause. These are not ordinary criminals, they come from good families, are educated but life experience has pushed them into the arms of The East. It brings to mind the kind of individuals who become radicalized and drawn into terror groups. However this isn’t explored enough. This isn’t to say it isn’t a good film, it works great as a thriller, reminiscent of other undercover films such as The Departed. Sarah is constantly under threat of being found out and has to decide when to go along with the actions of the group so she won’t blow her cover. There are some incredibly tense scenes that demonstrate this. Performances are good all round with particular praise for Ellen Page and Toby Kebbel and it’s these characters that make the audience sympathise with their cause. It’s an exciting, well made, well acted movie with a lot of bursts of brilliance making the two hour running time breeze past. It doesn’t provide any great insight into the morality of the actions portrayed on screen but it will definitely entertain. Its basically Donnie Brasco in Birkenstocks and is well worth a look. Love the director’s name! This one looks cool. I didn’t even know about it so thanks for bringing it to my attention! Does Jimmi Mistry star? Is there a hilarious arranged marriage scene? Haha sorry no mistry! You’re not gonna want to watch it now, are you? Yeah its really good. Slightly predictable but great fun. Plus you like everyone in it!